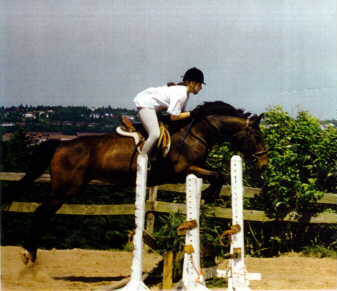 Would you like an experienced competitor to give their opinion on your jumping position? Or would you like to give your own opinion on each month's horse and rider? Simply email me (Leah C.)with a photo or use the form at the bottom of this page and I will forward the photo to our anonymous critiquer. To give your opinion (and if you have one, please give it! )fill out the form at the bottom of this page. All reasonable opinions will be posted on this page. But please remember, the views expressed here are simply young rider's opinions - always ask your trainer or instructor before drastically altering your jumping position. This horse is a cute little jumper. He�s knees are even, however just barely at the vertical. Though that may be due to the size of the fence. He�s using his head and neck real well. He�s slightly flat through the back and trailing his hind end a little bit, but over all he looks to be a good young rider�s mount. He also looks to be in good condition. His coat is clean and shiny and he�s in good weight. 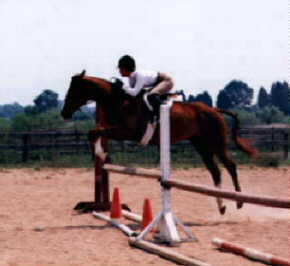 The jump standard is blocking the view of the rider�s leg a little, but from what I can see her toe is out a bit and her leg has slipped slightly back. Because of this I believe she is gripping with her knee instead of settling deep into her heel. Perhaps less of a knee-roll and some exercises with her standing up in her irons at the walk and trot will help get her leg back where it belongs without much trouble at all. She has a very nice crest release, though I would like to see her hands a tad lower. The reins are at an appropriate length and she�s up out of the saddle freeing up the pony�s back well. Her back is supple, yet fairly flat and her eyes are looking forward. The rider looks lovely. Her leg is secure at the girth and her heels are down. Her back is flat, head up, eyes looking forward. Her hands are too high for the crest release. She should drop them a few inches so the weight her hands are supporting, are pressing into the horse's crest. She seems very secure so I would begin to drop the hands even more and work on getting an in-hand release. Her irons look a bit too short for the height of the fence. If she lengthened them a hole she could then really settle down in her heel and stretch her calf. The horse is nice with his knees. They are level, even, and fairly tight. His back is a little flat and he's not using his head and neck quite enough. His hind legs are trailing a little bit and his ears are back. However, it looks like this horse would make a great Hunter Equitation mount. Both horse and rider are well turned out. I could not help but notice the lack of a jacket, but the animal is braided and clean, and the rider is in her boots, breeches, and rat catcher so I would assume that jackets were optional due to the heat. The horse is in good weight and his coat is shiny and clean. This pair look like they are a good team and are quite a presence in the Eq. ring. This rider and horse's turnout is great, for the circumstances. This rider looks as if she has a rather artificial jumping position... her legs are ineffective in the position they're in, her stirrups need to be at least 2 holes longer. Would you like to express your opinion? So, what's your opinion (and please be constructive!)? What is the URL (web address) of the photo? If you don't have a url, you can email me with the photo instead.